Japan might be known for its automated singing toilets, but tourism chiefs have lifted the lid on plans to upgrade thousands of public loos before the 2020 Olympics in Tokyo. They hope to see Asian-style "squat" loos converted into sit-on "western" models as the nation prepares to welcome millions of tourists. "We want them to enjoy touring Japan with as little stress as possible," said a Japan Tourism Agency spokesman. The high-tech country is known for its toilet technology, with features ranging from seat warming to bidet functions - with variable pressure. But agency spokesman Akihiko Yamakoshi said about 40% of toilets at 4,000 locations in popular tourist spots are "squatters", with a pan or bowl at floor level. He said some foreign tourists simply do not know how to use the older toilets, while others complain they are unsanitary. The government is offering to cover one third of the costs to install sit-on types, complete with the bidet function expected of a modern Japanese toilet. A record number of more than 26 million foreign tourists visited the country last year and the government wants the annual figure to reach 40 million by 2020. 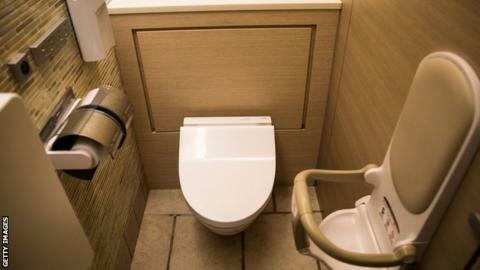 The toilet conversion is mainly designed for foreign tourists but it could also help elderly Japanese who may have difficulty in squatting down, said Yamakoshi.